Where to start? I guess, first and foremost, with a thank you to Marc Sardi! Marc and I met last summer at one of Ardelia Farm's Sunday Brunch and Blooms events in Vermont. What I didn't know then was that he had relatively little experience in floral design. His camera was near at all times, and he effortlessly gathered flowers and arranged them how they were clearly meant to be arranged. Natural, elegant. I was sure he was some kind of fancy designer, and I remember asking about his business. He said that he didn't really have one. That he was just sort of tinkering. A few weeks ago I noticed that Marc was starting to share some experiments with photographing his designs in the style of the old Dutch master painters on Instagram. I reached out to see if he might be interested in sharing a Q&A here on the blog, and then I realized that it would be a shame if I didn't just hop on the highway and go and chat with him in person in Montreal. There are some perks to living so far north! My own photos, I felt, were lacking. I remembered seeing some of my wedding floral designs head out the door last summer without capturing a record of them at all. This could be a really wonderful experience. Marc was so gracious. He took me up on the idea for the visit and set aside an afternoon to share more of his life and work, past and present, with me. Reuben Stewart (Instagram: @reubenmarkstewart) was visiting Montreal for the weekend, so he joined us for the afternoon. We met at Marc's apartment in Montreal, and I learned how he came to work with flowers. Marc was a scientific educator at the Montreal Botanical Gardens where he also earned degrees in horticulture and wildlife biology, He collected data from observation for bird surveys for 10 years and came to floral design as a hobby stemming from his interest in native perennials. He has no floral shop and no studio. He works from home for now. But, I have a feeling he'll need a larger space in the not too distant future. Marc noted that the Brunch and Blooms event last summer was a pivotal moment for him. It turns out that I wasn't the only one who noticed his talents, and the feedback from others that day encouraged him to dig deeper into his work with flowers. Marc studied photography in college. His background in the arts has played an integral role in helping him share his new work with flowers. 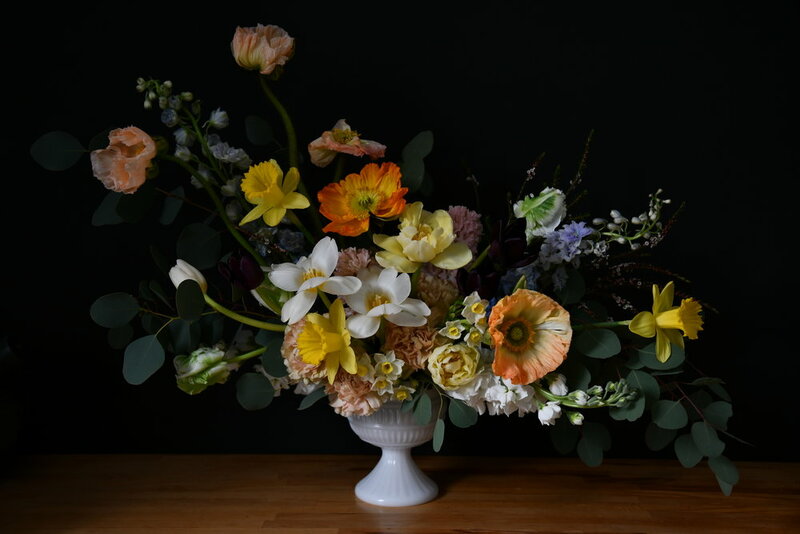 We agreed that it doesn't really matter how talented a florist you are- if you aren't able to collect images of your work it will be as if the work never existed. Fortunately, Marc shares openly that you don't need a big, fancy studio or a huge budget to build a portfolio that is of professional quality. Most of Marc's photos are taken at his dining room table or on the kitchen counter. And he often uses only Instagram to adjust photos. He adjusts images using (primarily) the brightness, contrast, and structure features. The structure setting helps those "Dutch master" images look more painterly. The tilt shift feature can help you achieve depth like you see with a 50mm lens. Marc's camera is a Nikon D7500. I was feeling proud pulling out my Nikon D3400, until I laid eyes in his camera! But Marc will tell you that the camera matters less than the lens you use. He has a lens that will stop down to F 2.8. The lower the F-stop capability of the lens, the more light it can allow in per shot. This is important, because you want to avoid having to take grainy photos in dark light at high ISO settings. I use the standard lens (18 to 55mm) that came with my camera and a 50mm lens that allows even more light in and blurring. The cameras are in "manual" shooting mode for these exercises. For taking photos in manual mode, you'll want to know how to adjust the shutter speed, F-stop metering, and ISO setting. For dark, Dutch master-style photography, the goal is to keep the F-stop number low. The ISO number low. The shutter speed high. If you don't have a camera that you can work with in manual mode, you can take really nice photos with a good cell phone. The newer cell phones have better cameras than most digital cameras. And they are often the only camera readily available when you're working. The newer iPhones can shoot in "portrait" mode for blurry backgrounds, too. Here are side by side photos. Nikon D3400 with 18-55mm lens on the left shutter speed = 1/50, F-stop = 3.5, ISO= 800. iPhone on the right. For the camera image, Instagram adjustments had to be made to brighten, increase contrast, and saturation. For the iPhone image, I needed to darken the image and increase the saturation and contrast. Both are lovely. I was able to get a little more "mystery" with the camera, but the differences are very subtle. Marc sets his arrangements on the table or counter. If he wants a dark background, a simple piece of black foam core is set against the wall. He doesn't have any reflectors. Everything is shot with natural light from a window nearby, but to the side of the set. Here are some photos of his kitchen "studio." We talked about direct lighting and use of a flash. Both can be used well, but they really require some nuanced study. If you look back in Marc's Instagram feed, you'll see the styled shoot he set up for a Valentine's Day promotion. The images are bold and lit by flash. It is a striking look. Perfect for his event and promotion. Direct sunlight outdoors will give arrangements a flatter look. See these side by side examples. One shot was shot in Marc's backyard. The other, on the dining room table. To achieve the following photo of Marc with his arrangement. We set my camera's (18-55mm lens) shutter speed at 1/60. The F-stop was 4.5. And the ISO setting was 800. When I got home I worked with even lower F-stop settings and ISO settings. You have to experiment and make small adjustments up and down with these settings to figure out the what works best. Take notes so that if you shoot under similar premises later, you won't have to figure things out all over again. Then, I adjusted the image in Instagram to brighten it, raise the contrast, and achieve a more painterly look with the "structure" feature turned up a bit. I love how this method really calls out flower colors and textures. It almost begs the viewer to take time and "unpack" the image to find all the little details that aren't immediately obvious, like that little frittilaria just peeking out of the darkness at the right. The image was cropped to the "Instagram square" and adjusted with Instagram tools. When you are shooting against a dark background, the greens and darker colors in your arrangements will likely fade or disappear all together. If there are a lot of branching greens in your design, it may look better to shoot your work against a lighter background. Here is an example of the same arrangement shot both ways. On the left, Marc shot his design in the kitchen, on the right, the design was moved to the dining room. I think both are beautiful. While we focused primarily on shooting floral work against simple backgrounds, interesting work can be done with patterned or "busy" backgrounds, too. Marc referenced this image from Tulipina as a successful example. But a busy background can be difficult to work with. You'll want to make sure that it compliments and doesn't distract from your work. I tried my own design against one of my paintings (second image). My own take: A spring design shot in the "Dutch master style" in front of one of my over-sized mixed media portraits. I love the light on the anemones and how elements like the spirea at left fade right into the canvas. Marc's final suggestion/reminder is to take lots of photos. Tons of photos! It is a good practice for everyone. When I'm shooting, there are some things that I just don't see in real life, but that appear clearer to me in photographs. In a way, the camera gives me an objective view of my work. I use photography to edit my floral designs. For more inspiration from Marc, visit his website at www.marcsardi.com or see his work on Instagram at @marc.sardi. Marc also suggests looking into the Instagram feeds of @basmeeuws and @doan_ly for for those of you who are interested in the use of light in botanical photography. For even more flower inspiration, check out this month's post on lesser known, beautifully curated Instagram feeds. Thank you again, for the wonderful visit, Marc! 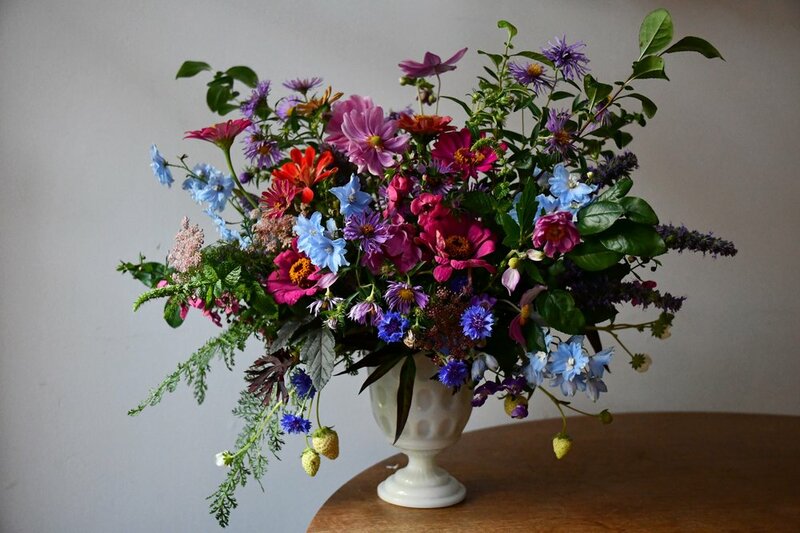 If you have a question related to flower growing, arranging, or marketing, please let me know. If I can't help with a good answer myself I'll go looking for someone who can help.